David Melia Stained Glass - What's new? Check back here regularly to find out what's going on at my company. 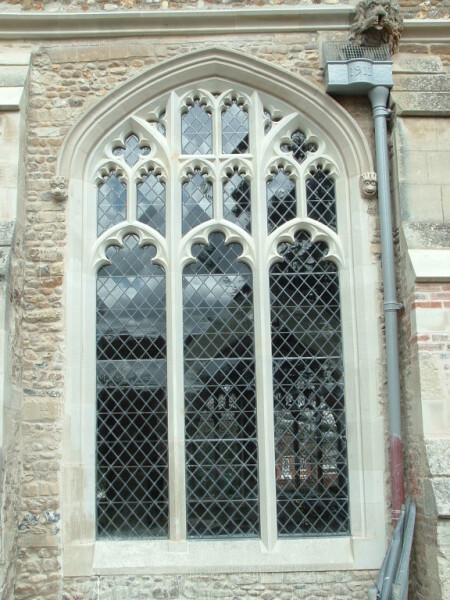 Recently completed window restorations at Saint Mary's Church Hitchin, in conjunction with Hibbitt & Sons (Masonry) Ltd Cambridge. Please view selected images above. A fine example of new panels made to a period victorian style for a private residence in Ely. The glass selection is a combination of typically used victorian colours tints and textures. The whole effect, in combination with the owners' restored original front door with new door furniture, makes for a warm and welcoming entrance to their home. As above front door and transom panels, viewed from inside hallway. A exceptionally large newly commissioned front door panel in a gothic revial style, combined with a celtic central feature. The new panel completely complimented the various period architectural features that are strongly featured elsewhere in the property. This panel is located on a top floor landing above the staircase. The stylised leaf design set against a warm radiating sunburst really highlights the varied glass tones and textures. The clients were extremely pleased with the finished panel, adding a truly unique feature to their home. New panels for an existing internal doorway. A typically elegant Georgian design to compliment the buildings true architectural style. New period design for hallway adjoining bathroom. Client requested a design that would compliment the original architecural features, as well as adding a bespoke elegance to the adjoining bathroom. 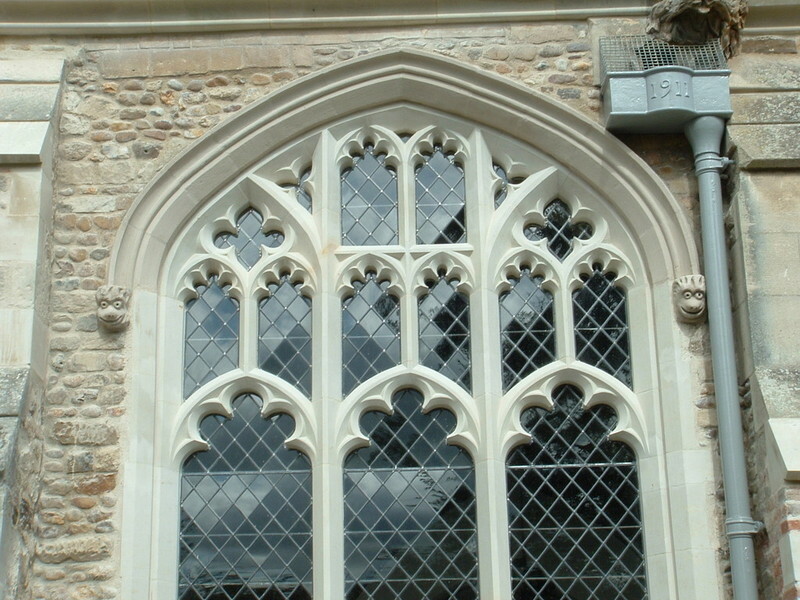 Recent restoration of a badly vandalised lower window section at Sawston Free Church, Cambridgeshire. Where possible all intact original glass was salvaged. 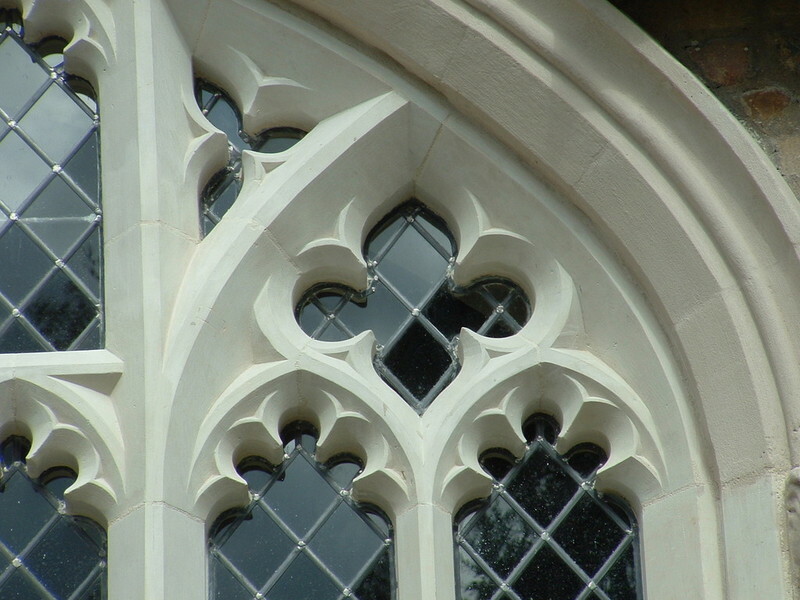 Broken pieces were replaced with new glass matching original tones and textures as closely as possible.